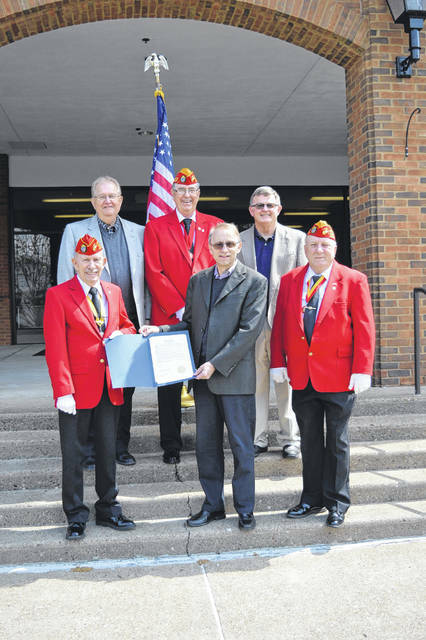 Gallia County Commissioners proclaimed May 4 and 5 Marine Corps League Days. From left to right stand Jim Doss, commandant of Mason-Gallia-Meigs Detachment 1180, Gallia Commissioner Harold Montgomery, Jerry Bain, jr. vice commandant for West Virginia Marine Corps League, Gallia Commissioner David Smith, Gallia Commissioner Brent Saunders and Chuck Cooper, chaplain of 1180.
https://www.mydailytribune.com/wp-content/uploads/sites/42/2018/04/web1_DSC_0117.jpgGallia County Commissioners proclaimed May 4 and 5 Marine Corps League Days. From left to right stand Jim Doss, commandant of Mason-Gallia-Meigs Detachment 1180, Gallia Commissioner Harold Montgomery, Jerry Bain, jr. vice commandant for West Virginia Marine Corps League, Gallia Commissioner David Smith, Gallia Commissioner Brent Saunders and Chuck Cooper, chaplain of 1180.